Thanks to the outrage and persistence of a 14-year-old girl from Buffalo, N.Y., female hockey players will appear for the first time in EA Sports' NHL video game series. Lexi Peters, 14, would often challenge her brother in EA Sports' NHL video games, but started to feel her enjoyment turning into frustration. He could create a character with his name and with his likeness; she could create a character with her name but that would appear on the ice as a man, as there was no option to create female hockey players. On the advice of her father, Peters took action: Writing letters of frustration to EA Sports COO Peter Moore, calling the exclusion of female players "unfair to women and girl hockey players around the world" and saying that it's "not fun" to play as a male character in the game, according to the Globe & Mail. Littman took her letters to the production team and declared, "We gotta get this girl in the game, and there are probably other girls like her that want to create their own female players." 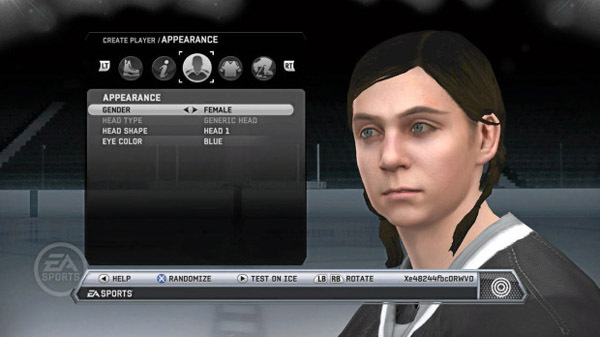 Female players can be created and used for the first time in "NHL 12," scheduled for release on Tuesday. "Lexi may or may not ever play in the NHL. But here she gets to play in the NHL, in the virtual world. And that's really important to us," said Littman. Peters had created players in previous incarnations of the game, but always had to settle for playing as a man on the ice. [INDENT]The 4 foot 11 teen has played hockey for four years. She and a teammate spent hours creating a whole custom hockey team, modeling the players after their own all-girls team, the Purple Eagles. The best they could do was give the characters long "hockey" hair. "We looked like men," she says. [/INDENT] Littman said her letters brought the issue home. "Here's a girl who's playing with her brother and she's not happy. She can't create herself," he said. The issue came to his attention during the production process, and it was immediately prioritized for "NHL 12." It didn't replace any features slated for the game, but the designers knew there had to be extra work done to incorporate female players in the create-a-player mode. As a tribute to the girl who inspired the change, the game's designers asked Lexi to send photos of herself in to EA Sports. Using those images, she became the default female character for the game â€” the model whose hair and eye color, uniform and name can be changed to suit the user. "Now she has an advantage over her brother," said Littman. "Her face is in the game â€” his isn't." So if a player can use a female character to make passes, score goals and block shots â€¦ can they fight, too? "Let's just say that when you create a female character, it's no different than creating a male character," teased Littman. While this is the first time EA Sports has allowed for female players in its hockey games, it isn't the first time a female character has appeared. 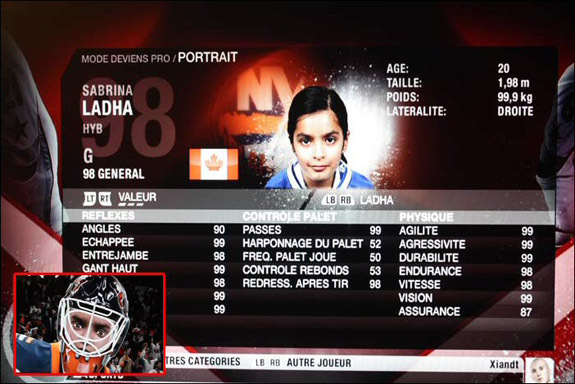 In "NHL 09," a female goalie named Sabrina Ladha is listed as a free agent with stellar player ratings. She's in the game thanks to a charity auction her father won as a fundraiser for the Make-A-Wish Foundation. Littman said that, technically, this is still the first time female players are available in the game. "We've never had the ability to create a female player. We had a girl whose picture and her name [were in the game] but the character was male," he said. "We didn't have the ability to create female characters. It's 100 percent true this is the first time you can put a woman in the game." Littman said with the growth of women's hockey around the world, the time was right to include female players and satisfy a growing audience for the games and for hockey. "We've introduced a lot of people to hockey. Not everyone's going to go to an NHL game or going to a game, but there are kids playing our game and getting introduced to hockey," he said. "How awesome it was that a girl was playing our game with her brother and getting so much enjoyment out of it?" Lexi Peters will no doubt enjoy it even more, now that she can finally be herself.